Think about the time you spend cooking when you camp ... You see that its fair enough to say a kitchen has to be comfortable, both for the well being of your patrol and to respect the environment. When cooking, also think about preserving the environment. For example you can keep the piece of turf you took out to dig your hole and replace it afterwards. Always think about cleaning when cooking. In order to do that you should prepare your kitchen : dig a hole for all biodegradable waste (vegetables, meat ...), dig a hole for dirty / cleaning water. You can alse make a stand for a waste bin where you will throw away plastics, tincans or papers. 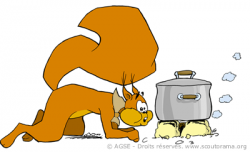 Last but not least, in order to be absolutely irreproachable do not leave your cookware lying on the floor. The floor is dirty and it would look messy. You can build this counter close to your firepit. Below put the dixies. Just over you can lay your own billycans so that they can dry. You should put them away when ready. 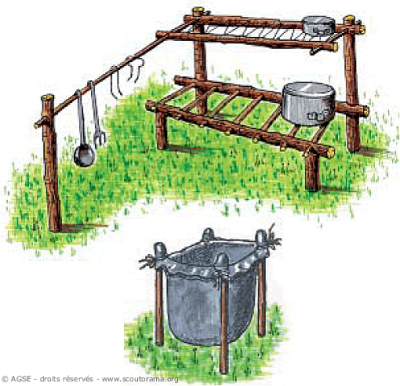 You can also put your cookware (forks, dipper ... ) It will also make a perfect draining rack. 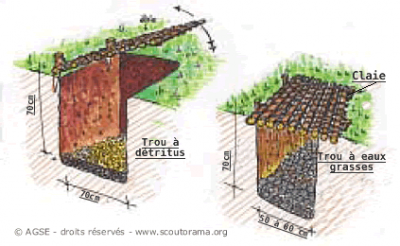 ETN Froissartage (Sd’E n°196) / French National Woodcraft Scout Team - translated from french by Pierre B.